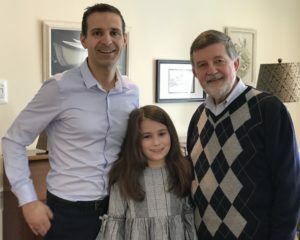 I was asked by the HCGM to write a short article about Socrates school and the fact that in addition to myself, my two sons went to Socrates and now my grand-daughter is a student there. Here then are some of my thoughts about Socrates school and why parents should consider sending their children there. One important challenge children of cultural minorities face as they grow up here in Quebec and Canada is how to ensure a successful integration into the mainstream society. Central to this is obviously the mastery of the two languages that will be the most useful to them here in Quebec, French and english. Not to be underestimated however is the acquisition a good knowledge of the language of their roots and, in our case, one that expresses so much of western cultural values. Between assimilation on the one hand and the comfortable protection of the ghetto on the other, will they find this path to integration in the wider society that allows them to be productive citizens of Quebec and Canada without abandoning their identity as Quebec Canadians of Greek origin? That was the hope that was at the centre of the decision that led my two sons, Alexander and Jason, to Socrates and it is what also led my son Alexander and his wife Eﬃe to choose the same path for my grand daughter, Katherine – to have an educational environment that would reflect the best of Greek values and give them a trilingual education. Socrates can provide our children with the confidence they need about their identity as full members of this society as well as give them the basis for a lifelong attachment to their cultural heritage. Western civilization was, after all, founded on Greek ideals, thinking, and the search for truth and understanding of the world. It was the first time humankind stopped being governed by the realm of the superstitious and gave control of its destiny to inquiry and the mind. The words of Socrates, after whom the schools are named, “The unexamined life is not worth living,” sums things up nicely. Insofar as Socrates school can teach these values and instil a thirst for understanding and learning in our children based on them, it can aspire to be the choice of preference of the members of our larger community. As our community grows locally with time and no longer through new immigration, each new generation will find it more and more diﬃcult to transmit the basics of the Greek language, culture and heritage. The grandparents that until now often played the role of keepers of the language and culture will soon be grandparents born and raised here by parents themselves born and raised here. English or French will inevitably come spontaneously easier for them than Greek. That is already the case for todays parents for the most part. That doesn’t mean that these parents feel any less “greek” but they can well use the support Socrates can give them in ensuring their children maintain that “greekness” as well. I feel the need to say here that the measure of this “greekness” doesn’t reside only in the skill with which one speaks reads and writes Greek, and certainly not in the development of blind nationalistic flag waving with every mention of the word Greek. It rests rather on integrating into ones belief system the values that have underpinned the society we live in today and that flow from what Hellenism brought to the world. The prerequisite to a decision by todays parents to send their children to Socrates is that the schools provide a quality of education that leaves nothing to be desired ( to strive for excellence is after all a fundamental greek value). How do they compare educationally with the better private schools? Do they have a good technological infrastructure? Do they oﬀer a respectful environment for the child? How do the graduates fare in onetting in to the better high schools? What percentage of Socrates graduates go on to higher education at the university level? These are questions parents considering Socrates will be asking themselves and should be asking the administration. When their mother and I made the decision to send Alexander and Jason to Socrates back in the late seventies and early eighties we did so because we felt convinced that in addition to english they would master French and learn Greek in an environment of our own cultural reality. It was a decision made less on facts (which no one had then) and more on faith and an attachment to the community. Along with us as parents, Socrates and their grandparents did succeed in this goal. Each today is fluent in french and english, has a good understanding of the greek language and is comfortable in their hellenic heritage. I believe the schools have much improved since that time and there should now be proof in studies and research that can comfort parents in their choice of Socrates for their children. I urge parents that are presently considering which school to choose for their children to put Socrates in the mix. Compare, ask, question. All other things being equal, the value of a healthy grounding in ones roots and identity counts for a lot in my view. Enough, I believe, to tip the scales to that choice. **** Christos Sirros (Greek: Χρήστος Σύρρος; born 2 February 1948) is a politician in the Province of Quebec, Canada. He was a Member of the National Assembly of Quebec (MNA) for the Laurier-Dorion riding for two decades as a member of the Liberal Party of Quebec. A graduate from McGill University, he first won the Laurier riding in 1981. He was most notably the Minister of Indian affairs under Robert Bourassa and Minister of Natural Resources under Daniel Johnson, Jr. He was the National Assembly’s First Vice-President from June 2003 to June 2004. Sirros left his seat in June 2004; he was then appointed Quebec Delegate General for Belgium, and served in the position until 2013. In December 2014, he was appointed the Quebec Delegate General for the United Kingdom.